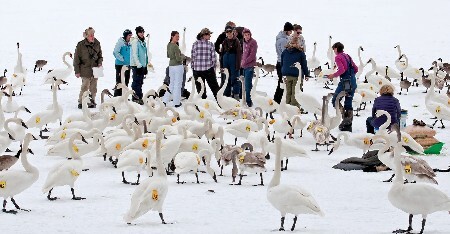 Looking to learn more about Trumpeter Swans in your area? 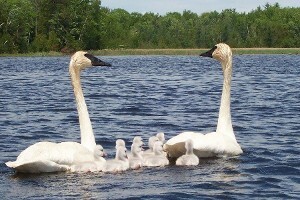 Below are a few selected articles and papers about Trumpeter Swans in different North American regions. The Index has a list of published research papers presented at 9th-20th Swan Conferences. Great background information about Trumpeter Swans, in the first 4 pages. Written in scientific language. Presented at TTSS 21st Swan Conference in 2005. Compiled by Dr. Donald A. Hammer, this is filled with quotes, diary entries, and many references to swans, both Tundra and Trumpeter. It has quotes from the Lewis and Clark expedition, John James Audubon, and a host of explorers across North America. 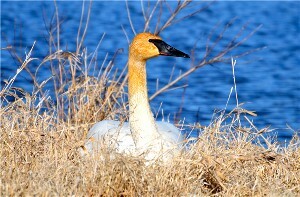 This document, from Wyoming Fish and Game, contains basic needs for Trumpeter Swans nesting and management. 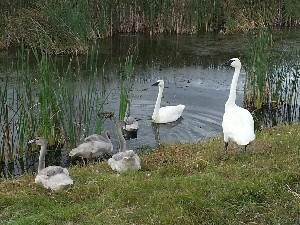 You may find it very useful if you live in an area where swans nest and want to attract them to your property. What better seal of approval could there be for your conservation efforts than to have a Trumpeter Swan pair choose your wetland and nest successfully? In many states, private landowners have worked hard to attract nesting Trumpeters. Sometimes the work involves constructing a new wetland or improving an existing site. Sometimes, nothing more is needed than to prudently curtail human activities in the pond vicinity to allow the Trumpeter Swans adequate security for nesting and brood rearing. Can you imagine the thrill of fledging wild swans as the fruit of your labors and waiting eagerly for their return in the spring? If you live in an area where Trumpeters occur and would like to explore the potential for your wetland to support successful nesting, much helpful information is available. Two of Wyoming's foremost Trumpeter Swan biologists, Dave Lockman and Susan Patla, have written this wonderful guide. 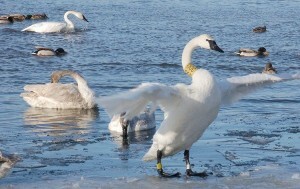 Leucism, which may include yellow legs and feet, is seen in some swans. 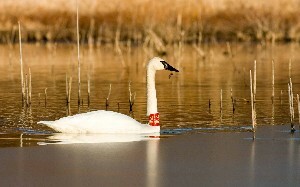 Harry Lumsden, Ontario, writes about Ontario's leucistic swans, which are descended from Red Rock Lakes National Wildlife swans. Harry Lumsden, who led Ontario's Trumpeter Swan restoration program, highlights some typical swan behaviors and their possible meanings in this 2018 paper, "Some Behaviour Patterns of Trumpeter Swans." 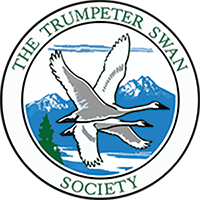 This paper, presented at TTSS's 21st Swan Conference, reviews the history of the return of the Trumpeter Swan to the Central Flyway, beginning with the restoration efforts at Lacreek National Wildlife Refuge, and the potential conflicts of the Trumpeter Swan's return to the Central Flyway with Tundra Swan hunts which occur in the Central Flyway. Iowa's story of Trumpeter Swans "trumpeting the cause for wetlands"
This is a brief review of the partnerships and efforts to restore Trumpeter Swans to Minnesota. The efforts began in the 1960s through efforts of Hennepin County Parks, and was later expanded by additional efforts by the Minnesota Department of Natural Resources and many other partners. TTSS was founded through the efforts of Hennepin County Parks to bring together swan research and experience to help bring a species back from the brink of extinction.